Glaucoma is an eye disease that slowly creep up to damage the optic nerve, eventually causing loss of vision. Feared for being worldwide second foremost cause of blindness, we should be alert and well-informed about it. During the early stages, glaucoma often produces zero symptoms, with an estimated 2 million Americans potential suffering from it, without realizing that they actually have it. The gradual nature of vision loss, it’s no wonder that it is dubbed as the “silent thief of sight”. More often than not, the disease would have to reach its later, more severe stage before the apparent vision loss and it might be too late by then, the damage might have been permanent. Prevention is the best medicine. Learn how to prevent glaucoma and protect your precious vision early. The result of optic nerve damage is glaucoma. As it “rots” your nerve away slowly, you will start developing blind spots in the vision. The damage to the optic nerve is related to increasing eye pressure, although research or doctors do not fully understand how. We have fluid (aqueous humor) that flows all throughout the eye. This fluid usually drains where your cornea and iris meet, from the front of your eye, through a certain tissue (anterior chamber through trabecular meshwork). The build-up of this fluid causes the increase in eye pressure. With that, if the drainage mechanism fails or there is too much fluid produced, the flow of fluid is thus disturbed and builds up the pressure. Ethnicities: You are 6 to 8 times more likely to have glaucoma as an African-American than Caucasian. Asia-Americans, Japanese-Americans and Mexican-Americans are at higher risk, too. 60 years old and above: Glaucoma is more common in old people, especially in the over 60 group. Chronic diseases: If you are already suffering from heart disease, diabetes, hypothyroidism and high blood pressure, then add glaucoma to that list of increased risk. Family history: Glaucoma can be passed down through genetics. Nearsightedness and eye injury: Nearsightedness means weaker optic nerves, as with eye injuries (eye tumors, inflammation, retinal detachment, surgeries etc.) can raise the risk. Corticosteroids: Using corticosteroids drugs is correlated to increased change of glaucoma, avoid the eye drops in particular. Due to the fact that it attacks you gradually, with few apparent symptoms, the best prevention is to perform regular eye exams. If you are considered at high risk of developing glaucoma, then have the exams every 1 to 2 years after the age of 35. Read the “Know Who at Risk” section for the related information. This should not be mentioned, but well, regular moderate exercise will benefits your health in a variety of ways. A simple walking or jogging, at least, three times a week leads to an overall fall in IOP. Note that the exercise only benefits those that continue to do so regularly. Closely follow a weekly routine for simple moderate exercise is recommended. Try to avoid yoga, however, since some positions that require you to be inverted (shoulder stands and headstands) put pressure to your eye and increase IOP. Get in touch with your GP if you are unsure if an exercise program is suitable for you. We can’t emphasise enough the importance of protecting your eyes. Always wear a protective eyewear during activities such as sports or home projects. As we mentioned above, eye injuries lead to higher risk of glaucoma (traumatic or secondary). Protect the eyes from potential injury and you will prevent glaucoma. Blood pressure increases with insulin levels, which also leads to higher eye pressure. Insulin resistance is known to increase eye pressure which leads to glaucoma. This is why people with diabetes and high blood pressure are at higher risk too. If your glaucoma is confirmed, your doctor will prescribe you with eyedrops. Use it regularly, even if you experience no symptoms (there is little symptoms on the early stages anyway). 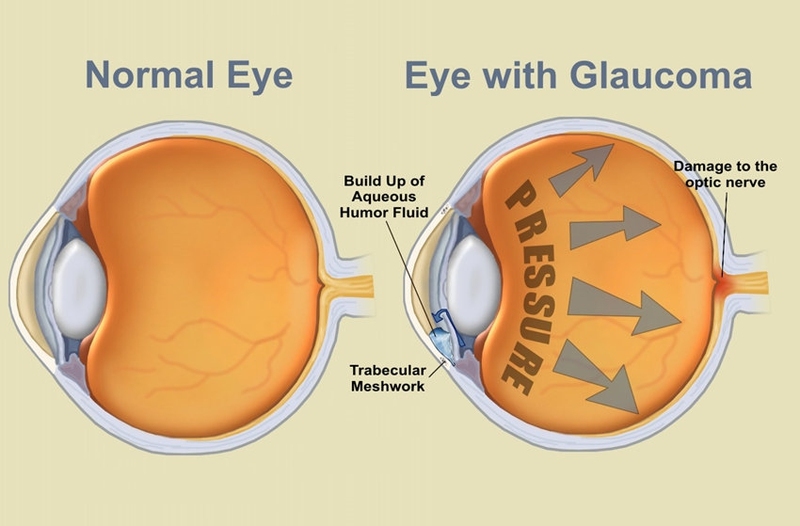 Glaucoma eyes drops will limit the build-up of eye pressure that leads to glaucoma. Server responsed at: 04/18/2019 10:47 p.m.